Roast pork is one of those can't-skip-comfort-foods from going home to Hawaii. It could be the Chinese version that my Dad brings back from a hole in the wall restaurant in Waipahu. I don't even know the name of it, but I can tell you how to get there. Or it could be the much loved Lechon Especial, also of Waipahu. We found a recipe that was so simple, we had to try it. And since you bake it, maybe it's a little healthier? Not really, but this is a good sometimes-treat and way too easy not to do at home. Dry the pork belly with paper towels as much as you can. This is the optional garlic step. Cut a few slits into the sides of the pork belly and stuff a clove of garlic into each of the slits. We used about 5. Go 5-for-5 on the pork belly. That is, rub the 5 non-fat sides of the pork belly with 5-spice powder. We didn't measure and just coated everything. Layer Kosher salt on the fat-side of the pork belly (see left photo). Don't sprinkle, it should be a layer and well covered. Lay it on a flat cooking rack. You will put this directly onto the middle rack of the oven. Put a shallow baking pan/sheet (like a lipped cookie sheet, mine is about 1" high) under the pork belly on the lower rack of the oven. Pour water into the pan so that it is about halfway to the rim. This will add some steam and keep your oven from being a complete mess. Bake at 350 degrees for one hour. After one hour, take it out of the oven and raise the temperature to 465. Yes, it is very hot. While the oven is heating, remove the salt crust. It will come apart pretty easily and remove absolutely as much of the salt as you can. Put it back in the oven and bake at 465 for 40 more minutes. If necessary, add a little more water (very carefully) to the drip pan. Take it out of the oven and let it sit for 10 minutes or so. Get out your cleaver and chop into cubes. 1) We tried two versions--with garlic and without, and couldn't tell the difference. The garlic ones had a mellow garlicky smell to them. 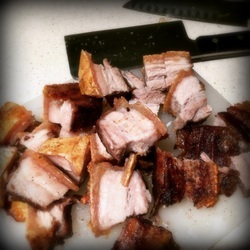 2) Pork belly is Very, Very Fatty. 2a) Flavor on the pork was awesome, but we did not eat the "middle fat" and only some of the crunchy part. Not because we didn't want to, but because we like to keep our arteries flowing.